Fill a large pot with water and salt, bring to a boil. Trim woody ends off the asparagus on the diagonal. Then cut in half. Each piece should be 3-4 inches long. In a small bowl mix together the lemon juice, Dijon mustard, salt, and fresh ground black pepper; slowly whisk in the olive oil until emulsified. Put trimmed asparagus into the boiling water, stir, and cook 2-3 minutes until asparagus is crisp tender. 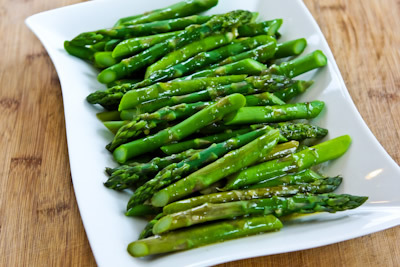 Drain asparagus into a colander then blot dry with paper towels. Arrange the asparagus piece on a serving tray, drizzle lemon-Dijon vinaigrette over, and serve.